Look For The Silver Lining | What is the Meaning & Purpose of Life? If you have encountered a devastating setback, and wondered “why me?”, along with an accompanying feeling of being isolated, at least take heart in the fact that you are NOT alone in such an experience. We’ve all encountered this. But instead of wallowing in an emotional abyss, cancel your “pity-parade” and start looking. For what, you may ask? 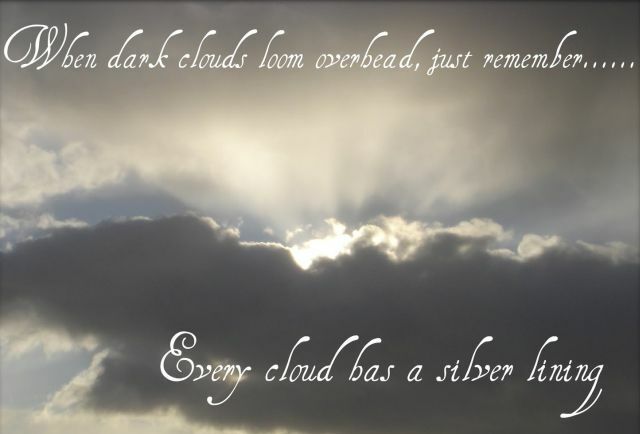 Start looking for “the silver lining” in your dark clouds. It is ALWAYS there, and often there are MANY of them, but you’ve got to LOOK FOR IT. And don’t be alarmed or frustrated if you don’t see it right away. In fact, your misfortune may have temporarily blinded you to it. But hang in there, for if you search with a mindset that it exists, it will eventually materialize, and often with profound clarity. But don’t give yourself a flat-forehead for not seeing it sooner — just rejoice in your epiphany. Not let’s cover this from three perspectives: (1) the sage aphorisms of Maya Angelou; (2) the underlying themes of Silver Linings Playbook; and (3) the lyrical candor of the Swedish sisters of First Aid Kit. 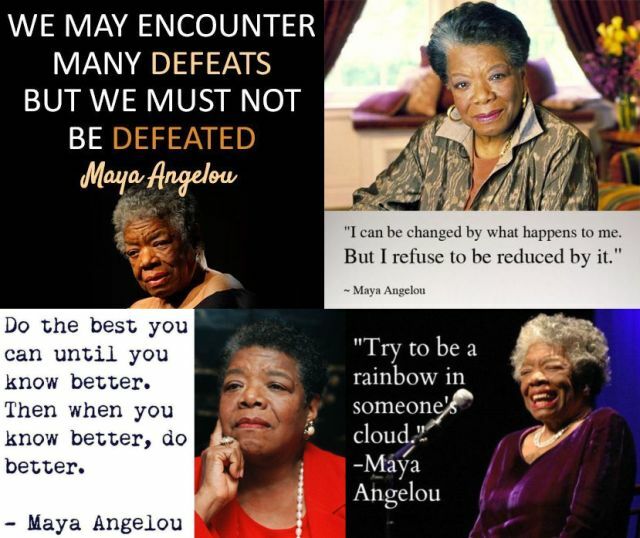 The poet, author, activist and renaissance woman, Maya Angelou has many aphorisms attributed to her that are especially germane to this topic, and are reflected below. They collectively encourage you to overcome your defeats, learn from them and acquiesce to your transformation into something greater so that you may eventually help others overcome their “rainy days”. Now let’s take the romantic comedy-drama Silver Linings Playbook, a cinematic tour de force, based on the book by Matthew Quick, which really delivers on the core element of overcoming adversity. It is a touching love story about two seemingly lost souls, who serendipitously find each other, and despite an awkward and unexpected journey together, eventually help one another out of their respective doldrums that have bordered on depression in the past, albeit for entirely different reasons. He (“Patrick” played by Bradley Cooper) suffers from a bi-polar disorder and is despondent over his wife’s estrangement, while she (“Tiffany” played by Jennifer Lawrence) has encountered profound difficulty in coping with the emotional loss of her husband’s death and adapting to life as a young widow. The below movie trailer summarizes this well, and the two quotes that follow are relevant and especially poignant. First Aid Kit is the name of a Swedish folk duo, comprised of sisters Johanna and Klara Söderberg. Their music video rendition of My Silver Lining is presented below, and is followed by the lyrics to this song. While there may appear to be some conflicting messages (“I don’t want to wait anymore, I’m tired of looking for answers” and “There’s no starting over, no new beginnings”) the interpretational gist of this song is nevertheless consistent with the themes of this blog post. For instance . . .
“Something good comes with the bad . . . There’s hope, there’s a silver lining” — This is self-explanatory and if you can remember only one thing from this blog post . . . THIS IS IT ! 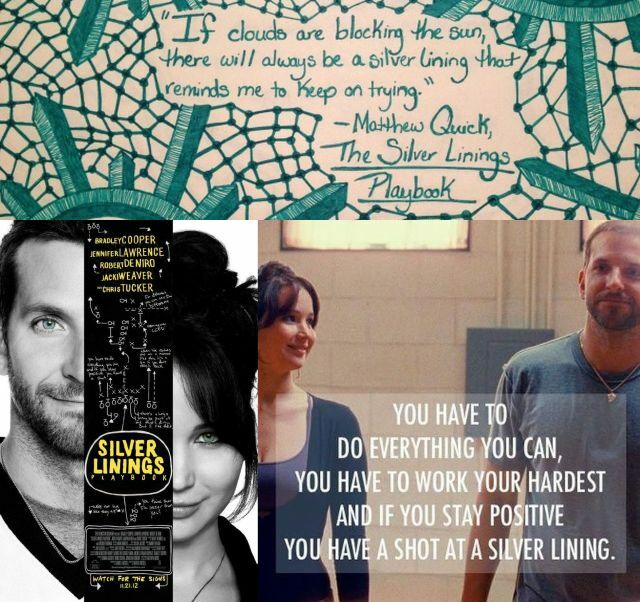 This entry was posted in Believing in Yourself, Never Giving Up, Overcoming Loss, Overcoming Obstacles and tagged Bradley Cooper, First Aid Kit, Jennifer Lawrence, Johanna Söderberg, Klara Söderberg, Matthew Quick, Maya Angelou, My Silver Lining, Robert DeNiro, Silver LInings Playbook. Bookmark the permalink.